All the info you need on Triumph's mid range Daytona sports bikes. Looking for a modern, compact Sportsbike but want something a little different to the Japanese offering? Want to show your support for the British bike industry? Triumph's excellent range of Daytona 600, 650 and 675 machines have a cult following and make great second hand purchases, with prices from just £2000. Hot on the heals of Kawasaki's popular 636cc ZX-6R, Triumph proved that to be competitive in the 600cc Supersports road bike market, you don't have to stick to 600cc. The extra midrange that the increased capacity Daytona 650 and 675 provided, gave it the edge on the road, whilst still having the chassis to entertain on track. Triumph's 675cc triple motor made it into our 10 best motorcycle engines ever feature, it's that good. 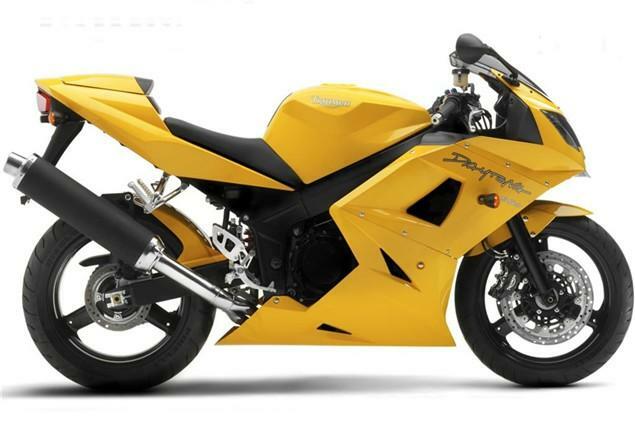 The Daytona 600 can be picked up for as little as £2000. It's got fantastic handling and it's comfortable too. You can read our Daytona 600 road test review and read real world owner reviews of the Daytona 600. The Daytona 650 burst out of the 600 mould and can now be picked up for £3000. The 650 offers stronger midrange than the Daytona 600 and the gearbox was redesigned to offer a slicker change. You can read our Daytona 650 road test review and read real world owner reviews of the Daytona 650. Sharing the powerplant with the highly acclaimed Triumph Street Triple, Triumph dropped the four cylinder engine in favour of a more powerful and lighter 675cc triple engine, now producing 123bhp and with even stronger mid range. Check out our Daytona 675 road test review and read real world owner reviews of the Daytona 675. Visordown's review section is here to help you decide which model is for you. Containing all the Daytona specifications, images, first rides, road tests and current owner's reviews, it's the place to come before buying your next motorcycle. If you already ride one of Triumph's finest, why not find your bike and add your own review? You can also visit Daytona600.org and Triumphrat both popular Triumph forums for more information on the Daytona series.